Our shipwrights are local Panamanians, who learnt their trade on wooden fishing boats - construction, planking and caulking. They know their woods and boat construction - and under instruction, these skills are being extended. The wooden fishing boat is history, but restoration of historic wooden boats has given life to this industry. Currently, we have three restorations happening. Every one is a source of pride. And our prices beat other yards - anywhere in the world! Simply, we have the woods - mahogany, teak, and local hardwoods at unbeatable prices a board foot. We know our woods and our shipwrights work at competitive prices. The result is that we can produce quality at a fraction of the price of any classical restoration yard. Sea Phoenix snd masts head for Astillero's travel lift. .
Ranger was built in 1914 by Burger Boats in Manitowoc. She is a Gentleman's Racing Schooner designed by Charles Drown Mower. A pencil slim hull of 90 feet overall with a 16 ft beam and a drop keel, she sails like a witch and is deservedly, a well loved boat. Ranger is listed as an historic Great Lakes Vessel by the Bowling Green State University, Ohio. No longer in the USCG registry, she was renamed Racy Ranger under Cayman Registry after she was sold in California. Time and the tropics caught up with her and she sank in a storm in Panama. We raised her and rebuilt her from the keel up with ironwood ribs, mahogany planking, teak decks and a sitka spruce masts. Here she is being launched at the Astillero Nacional in Vacamonte. She is now a Panamanian registered boat - Sea Phoenix. was November 2014! Built in Manitowoc by Burger Boats, she was first launched November 1914. Ranger was swamped by waves and sank in Panamá in 2007. Raised from a watery grave, she has been rebuilt from the keel up in Panamá. She now has ribs of guayacan, planked with Panamanian mahogany, teak decks and cabin top, a hybrid engine and Sitka Spruce masts. 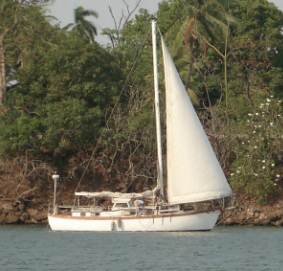 She needs to be hauled for maintenance and repair; fitted with her original interior and get a new set of sails. and head out to sea! Valkyrien was built in Auckland in 1927 by Charles Bailey. She is a solid kauri hull with quadruple planking and pohutukawa floors. Her fascinating adventure filled life on the Pacific is legendary. Two years ago, she left San Francisco for Washington DC in poor condition. After a troubled passage down the Pacific coast, her journey ended at Playa Venao, a remote surf beach near Punta Mala. Her boom broke, the engine overheated and she was leaking badly. Her owners gave up and left her high up the beach with the anchor out. Delivery to Vacamonte for repair was commissioned, but proved impractical. The boat had been beached on a high spring tide and another was not due for at least a month. Salvage was the only option. It was no easy task to get her to Vacamonte. Work has begun on restoration. Charlie Girl - once Fernweh - is our personal project. That means she is last in line of attention. Originally from California, she was close to sinking when we took charge. Planks had rotted, caulking in need of replacement. She leaked through deck and hull. So far, much of the hull has been replanked and re-caulked. And she had a fresh coat of paint. Cabin top needs major work. The story of Dunkirk and the Little Ships that crossed the English Channel and save the lives of over 300.000 English and French soldiers trapped on the beaches at Dunkirk in May to June 1940 was one of the most remarkable tales from the Second World War. There was a call for all vessels between 30 ft to 100 ft. to be available for the evacuation. Crewed by volunteers and service men the flotilla of barges, motor launches, life boats and yachts rescued the British Expeditionary Force under heavy fire and brought them back across the Channel. The Association of Dunkirk Little Ships has been formed to save and honour these small vessels that saved thousands of lives. They are also restoring them. Age is no object. Check the boats and their stories. 42 Dunkirk Little Ships will assemble this year at Barns Elm Reach on the Thames near Putney - the largest single class of powered boats taking part in the Diamond Jubilee Pageant on the Thames on June 3. They will head from there downstream immediately behind the Royal Section. A further 5 Little Ships will be taking part in the Avenue of Sail. The Royal Jubilee Pageant Calender with a list of ships taking part can be found here.